Some area bus drivers are questioning their safety, one day after a man attacked a bus driver, stole the bus and fatally struck a man at a gas station in Northeast Washington. Police said the hijacker, Keith Loving, 30, boarded the bus in the 3800 block of Jay Street in Northeast D.C. Tuesday morning. When the bus arrived at its next stop, Loving got up and attacked the driver with a tool, police said. But the bus was missing one thing that may have helped the driver -- a protective shield. Fewer than one quarter of Metrobuses were equipped with the shields as of Tuesday, a Metro representative said. Of the 1,542 buses Metro operates, 326 buses have the shields. Another 531 buses will have the safety devices by the end of 2016. The shields are typically used in areas where drivers have previously had trouble, the Metro representative said. "He would've had to climb the dashboard to get over onto the bus driver, but the shield would've been of some help," said a Metrobus driver who didn't want to be identified. According to WTOP, the driver was able to hit an emergency button before he got off the bus. He suffered a back injury while getting off of the bus, but he is expected to recover. 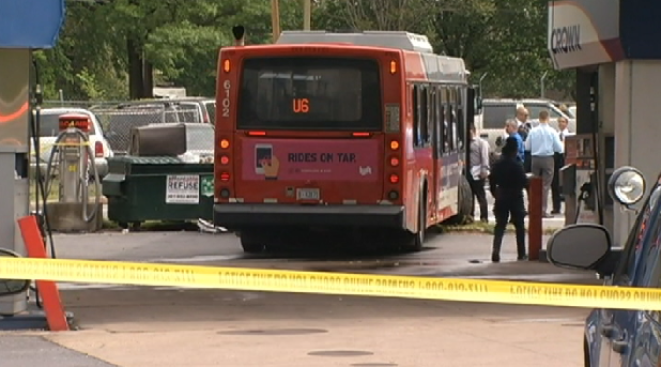 Passengers on the bus saw the attack and ran out the back door, D.C. Police Chief Cathy Lanier said. A short time later, police said Loving veered over a curb into the parking lot of a gas station at the corner of Minnesota and Nannie Helen Burroughs avenues. The bus ran over 40-year-old Anthony Payne, a gas station worker who had been taking out the trash. Payne was rushed to a hospital and pronounced dead. "It's just unbelievable. I'm just loss for words," said the Metrobus driver who didn't want to be identified. "I just stay prayed up. Before I enter these gates, I pray." The union representing bus drivers said they want more officers to patrol buses. "This union, representing more than 9,000 of the operators, station managers, clerks and mechanics of Metro, is calling upon Metro to take action and immediately increase police presence," Amalgamated Transit Union Local 689 said in a statement. "The lives of transit employees and our riders are depending on it." Metro deploys officers based on where they see spikes in crime. Attacks on drivers have declined by about 30 percent in the past year, the Metro representative said.